Mr. Magoo is a senior poodle (mix?). His age estimate is around 10 years old. Magoo gets around great for an older fella, especially considering he has cataracts and is functionally blind. His healthy weight is around 13-14 lbs. Magoo is shaved right now because he was very matted when he arrived with us but he will have beautiful black curls when it grows back out. Magoo likely lost his sight due to uncontrolled diabetes. When he arrived with RCHS he had lost about 1/3rd of his body weight and was very sick due to this untreated condition. He is now back up to a healthy weight and feeling much better after his first month of insulin. 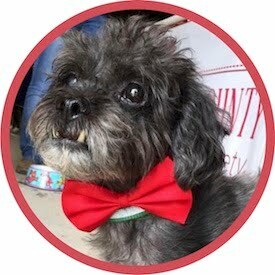 Magoo’s adopter will need to be willing to continue working with their vet to keep his diabetes under control and be comfortable giving twice daily insulin injections. We would love to see Magoo go to a home with experience managing diabetes but we are also open to adopters willing to learn. Magoo absolutely charms every person he meets. He is an incredibly good natured dog. Even when he felt terrible he never gave anyone any trouble about anything. He is great with other animals. Mr. Magoo just wants to love and be loved.